Cigna TTK - Saraswat Cooperative Bank Ltd. Safeguard your health with financial support for expenses related to hospitalization such as room accommodation, treatment costs, diagnostics, consumables and drugs. Treatment related expenses before and after hospitalization are also covered for specified number of days. Our Protect Plan provides an insurance coverage of up to Rs. 10 lakhs for individuals and families. This plan has been designed to provide a comprehensive coverage for treatment of diseases leading up to and during hospitalization. Apart from hospitalization, the insurance amount also covers Day Care procedures and Domiciliary Treatment. You can also take an expert second opinion on Critical Illnesses and get a Worldwide Emergency Cover when you are away from home. Entry age & renewal:The minimum entry age is 91 days for children and 18 years for adults. There is no maximum age limit for entry under this policy. The plan provides lifetime renewal opportunity. Is a medical test required before enrollment? Depends on the age and the sum insured opted for. What determines premium? Apart from age, lifestyle, sum insured, gender and results of the medical test (if undertaken), the geographical location also determines premium. Cities and town have been divided into 3 separate zones. Policy period: One can choose between 1 year, 2 years and 3 years term. Family discount: 10% discount on the premium amount for enrolling more than 2 family members under a single individual policy. Long term discount:7.5% for selecting a 2 year and 10% for selecting a 3 year single premium policy. Our Plus Plan provides an insurance coverage ranging from Rs. 4.5 lakhs to Rs. 10 lakhs. All hospitalization expenses such as treatment costs, diagnostics, drugs and accommodation charges are covered. Pre & Post Hospitalization expenses are also covered for a specified number of days. This plan provides total value for money health protection against all unforeseen health complications as well as covers maternity and pays for expenses pertaining to the medical treatment of the newborn. We take care of the smaller expenses towards consultation and pharmacy charges through Health Maintenance Benefit. There is also a reward for no claims by way of Cumulative Bonus or Cumulative Bonus Booster. A second opinion help on Critical Illnesses from an expert and a Worldwide Emergency Cover also available when you are away from home. We strive to keep you healthy at all times with a Health Check-up after every renewal. Entry age & renewal: The minimum entry age is 91 days for children and 18 years for adult. There is no maximum age limit for entry under this policy. The plan provides lifetime renewal opportunity. Is a medical test required before enrolment? It depends on the age and the sum insured that you have opted for. What determines premium? Apart from age, lifestyle, sum insured, gender and results of the medical test (if undertaken), the geographical location also determines premium. Cities have been divided into 3 separate zones. Policy period:One can choose between 1 year, 2 years and 3 years term. Family discount:10% discount on the premium amount on enrolling more than 2 family members under a single individual policy. The Premier Plan provides a high insurance coverage of 100 Lakhs with world class end to end benefits from in-hospital to home care. In addition, it includes a Worldwide Emergency Cover up to full Sum Insured, making it an All-in-One plan. This plan has a reduced waiting period of just 2 years for pre-existing diseases that helps you get full coverage sooner. We take care of your smaller expenses towards consultation, diagnostic tests, pharmacy charges and other outpatient expenses through Health Maintenance Benefit. In addition, this plan covers Maternity and pays for medical expenses for the New Born. You also have an Expert Second Opinion benefit on Critical Illness. Due to high coverage you will not have to opt for a separate Critical Illness plan. Having a 100 lakhs Sum Insured ensures that you stay prepared to face any health exigency, be it an accidental hospitalization or recuperating from a Critical Illness. We strive to keep you healthy at all times with a Health check-up facility after each renewal. Entry age & renewal: The minimum entry age is 91 days for children and 18 years for adults. There is no limit for entry under this plan. The plan provides lifetime renewal opportunities. Is a medical test required before enrolment? Yes, medical tests are mandatory. Policy period: One can choose between 1 year, 2 years and 3 years. Family discount: 10% discount on the premium amount on enrolling more than 2 family members under a single individual policy option. Long term discount: 7.5% for selecting a 2 year and 10% for selecting a 3 year single premium policy. This unique plan has been designed to take care of all your hospitalization related worries with power packed benefits. The Sum Insured option ranges from Rs. 15 lakhs to Rs. 50 lakhs. You will enjoy a Worldwide Emergency Coverage up to full sum insured while you are away from home. The Preferred plan has a reduced waiting period of just 2 years for pre-existing diseases that helps you get full coverage sooner. We take care of your smaller expenses towards consultation, diagnostic tests, pharmacy charges and other outpatient expenses through Health Maintenance Benefit. In addition, this plan covers Maternity and pays for medical expenses for the New Born. You also have an Expert Second Opinion benefit on Critical Illness. We strive to keep you healthy at all times with a Health check-up facility after each renewal. Sum insured options: Rs. 15 lakhs, Rs. 30 lakhs, Rs. 50 lakhs. Entry age & renewal:The minimum entry age is 91 days for children and 18 years for adults. There is no maximum age limit for entry under this policy.The plan provides lifetime renewal opportunities. Policy period:You can choose between 1 year, 2 years and 3 years term. Family discount:10% discount on the premium amount on enrolling more than 2 family members under a single individual policy option. A life altering illness is something we do not think about and definitely do not plan ahead for. When such a situation arises, it can leave us feeling under-prepared and unsure. Such events significantly impact your lifestyle. To help you tackle any such unforeseen situations with ease, Cigna TTK brings you Lifestyle Protection-Critical Care. It is a meticulously thought out plan that begins by helping you stay healthy, and covers you for the most unanticipated eventualities. What’s more, it even gives you an option to choose exactly how you would like your payout to be (lump sum or staggered). Read on to find out a few important aspects of this health insurance plan. Entry age & renewal: To enroll in this plan, you must be in the age group of 18 to 65 years. You can renew this plan for lifetime, which ensures that you continue to be insured even at higher ages. Requirement of medical tests: Will be determined based on your age, plan, sum insured and medical history. Deciding the premium: The premium will depend on the plan, sum insured and policy tenure along with your age, gender and health status. You have an option to avail an annual premium instalment for 2 and 3 years policy. Policy period: You may choose between a 1, 2 or 3 years policy period. Cover Type: The policy can be purchased on an individual & family basis. Family discount: There will be a 10% discount on the premium amount for enrolling more than 2 family members under a single policy. Staggered Payout – On occurrence of a Critical Illness, 25% of the sum insured will be paid as lump sum. The remaining 75% and additional 10% of sum insured will be paid in 60 equated monthly installments. You also have the flexibility to opt for a lump sum payout at the time of claim settlement, if you so desire. * Sum Insured above Rs. 3 Crores will be considered on case to case basis. Our Lifestyle Protection-Critical Care covers upto 30 critical illnesses. Basic Plan covers first 15 and Enhanced Plan covers all 30 Critical Illnesses. Our customized wellness program is designed to cater to your varied health needs. It’s a service available to all our customers, which empowers them to make sustainable lifestyle changes. 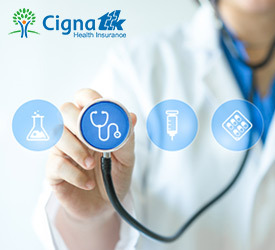 It consists of online programs like Health Risk Assessment, Lifestyle Management Programs, Nutrition Programs and access to health articles through the Cigna TTK Website. On first diagnosis of the covered critical illness, we will pay the sum insured under the policy, provided the insured person meets the applicable waiting periods. This money can be used to cover your medical bills or maintain your lifestyle. We understand your need for an expert opinion for deciding on the best course of action. You have the benefit of seeking a second opinion from our network of medical practitioners, on being diagnosed with a covered critical illness. The Cigna TTK Lifestyle Protection-Accident Care plan provides a comprehensive coverage that safeguards your family's financial health in case of unfortunate events like accidental death or disablement including loss of employment cover and education fund benefits. Additionally, there are optional covers like Temporary Total Disablement, Burns Benefit, Broken Bones Benefit and Coma Benefit. Sum insured options: You have the flexibility to choose an amount ranging anywhere from Rs 50,000 to Rs 10 Crores. Eligibility depends on your income, with the maximum being 10 times of annual income. For non-earning family members, the sum insured for spouse is limited to a maximum of 60% of the earning member and for a dependent child, parents, in-laws and siblings, it’s 30% of earning member’s sum insured. Entry age & renewal: For children, the minimum age to get enrolled is 5 and maximum is 25, whereas for adults, the minimum age is 18 and maximum, 80. You can renew this plan for lifetime, which ensures that you continue to be insured even at higher ages. Coverage for policies issued to persons above 70 years will be limited to Accidental Death & Permanent Total Disability only. Requirement of medical tests: Persons above 70 years up to 80 years may be accepted subject to Medical Underwriting. Deciding the premium: The premium will depend on the plan, optional covers, sum insured and policy tenure. You may choose to pay via single premium mode or annually in case of a 2 & 3 year policy term. Cover Type: You may choose to purchase the policy on an individual or family basis. Relationships Covered: This policy will cover self, spouse, dependent parents and dependent parents in-laws in addition to dependent children and dependent siblings up to the age of 25 years. Claims Payout: Under this policy, fixed benefit amounts will be paid as specified in the applicable benefits in accordance with the terms and conditions.